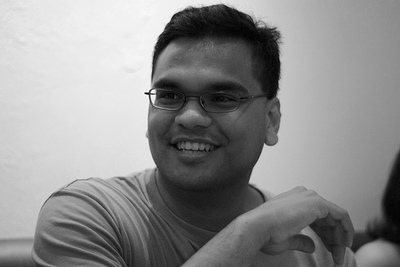 I'm a Computer Science (Ph.D) graduate from the Singapore-MIT Alliance programme at the National University of Singapore. For a living, I currently convert caffeine into code at Google. I've worked with IBM's Tivoli group, developing for their single sign-on application and associated services. I spent a little time working for Efficient Frontier, developing algorithms for Internet marketing using search and display advertising, and Yahoo! on their advertising platforms team. At Google, I work on the search ads serving team. In grad school, I did research on algorithms and applications in Structural Computational Biology. My advisors were David Hsu and Tomas Lozano-Perez. I wrote an Android app that shows random messages from BSD's fortune program. I wrote write-only, a web-based writing application. I taught an introductory Python class at Stanford's ESP Splash program with Rob Tirrell. Resources here. I wrote a small plugin to allow TiddlyWiki to act as a blog, which can be found here [This was for an old version of TiddlyWiki and is probably obsolete at this point]. Last updated on Novmber 30, 2010.